F-35 fighter aircraft completes first airborne weapons separation. Traveling at 400 knots at an altitude of 4,200 ft, BF-3, a short take-off and vertical landing F-35B variant, released an inert 1,000 lb. GBU-32 Joint Direct Attack Munition (JDAM) separation weapon over water in an Atlantic test range. 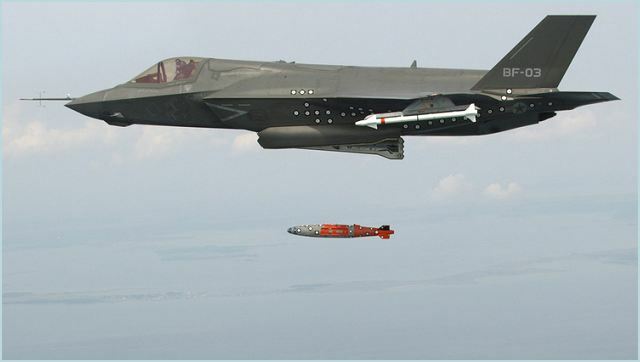 The release was the first time for any version of the F-35 to conduct an airborne weapon separation, as well as the first from an internal weapons bay for a fighter aircraft designated for the U.S. Marine Corps, the United Kingdom and Italy. The milestone marks the start of validating the F-35’s capability to employ precision weapons and allow pilots to engage the enemy on the ground and in the air. An aerial weapons separation test checks for proper release of the weapon from its carriage system and trajectory away from the aircraft. It is the culmination of a significant number of prerequisite tests, including ground fit checks, ground pit drops and aerial captive carriage and environment flights to ensure the system is working properly before expanding the test envelope in the air. Aircraft and land-based test monitoring systems collected data from the successful separation which is in review at the F-35 integrated test force at Naval Air Station Patuxent River. The F-35B is the variant of the Joint Strike Fighter designed for use by U.S. Marine Corps, as well as F-35 international partners in the United Kingdom and Italy. The F-35B is capable of short take-offs and vertical landings to enable air power projection from amphibious ships, ski jump aircraft carriers and expeditionary airfields. The F-35B is undergoing test and evaluation at NAS Patuxent River and Edwards Air Force Base, Calif. prior to delivery to the fleet.